MrMewMew is on the Ultimate Marvel vs. Capcom 3 grind. Check out the uploader's "Devil with a Blue Coat" combos. 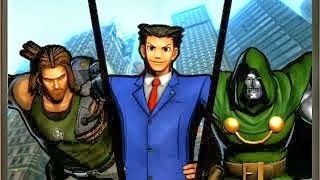 It's well known that Spencer and Doctor Doom are two characters that shouldn't be taken lightly in Ultimate Marvel vs. Capcom 3 but how about Phoenix Wright? MrMewMew has thrown the "Ace Attorney" with the wolves to produce some damaging results.